Zoé, 3 years recently joined the association. She lives in Nord Pas-de-Calais (North of France). Enora A., 5 years and lives in Toulouse (South of France). 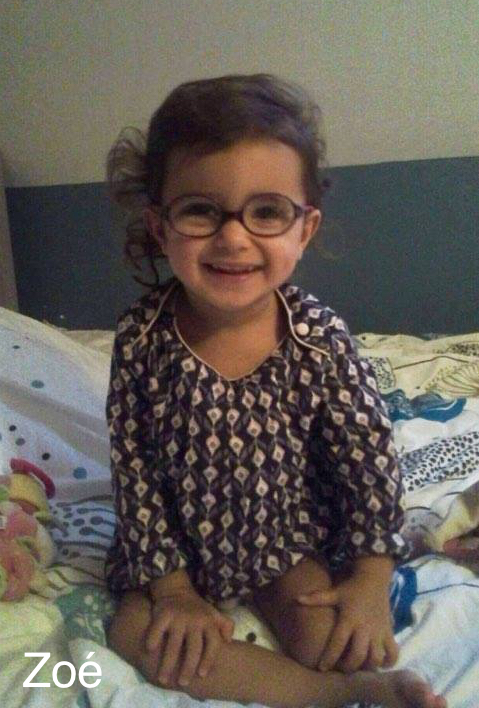 Enora T., 3.5 years and lives in Rennes (West of France). There are two little girls from Britanny both named … Enora ! It will be a challenge not to mix them up in this story! Our little Zoe was born prematurely at 32 weeks on January 12, 2014. After an MRI and various medical appointments, the diagnosis falls: Cerebral palsy with sequellar lesions of peri-ventricular leucomalacia. Also called left predominant asymmetric tetraparesia. After the shock of the diagnosis, we decided to fight! Zoe is stimulated at home but also at the nursery. 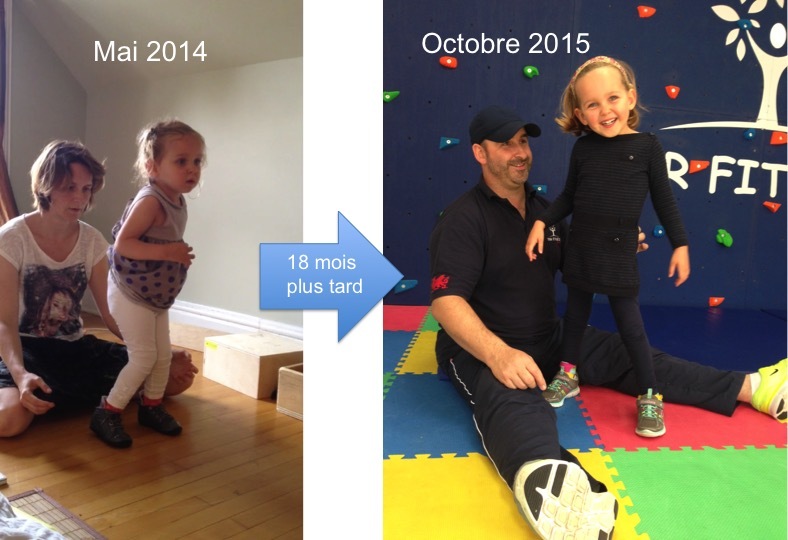 At 11 month old : Zoé integrates a rehab center: Physiotherapy twice a week (2 X 45 min). 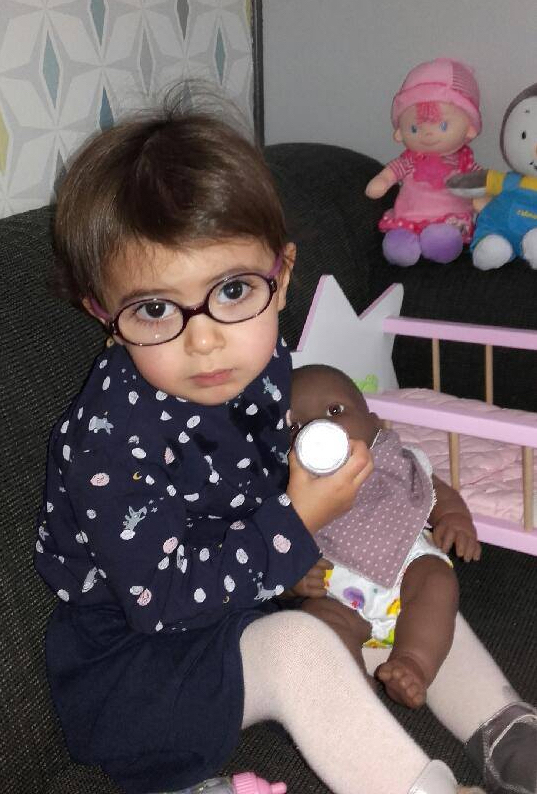 At 12 month old : Zoé wears his first glasses, which allow her to discover the toys! At 18 month old : Zoe turns herself on the floor for the first time! At 28 month old : Zoe sits by herself for a few minutes. At 33 month old : First Botox injections with dedicated rehab during 4 months. At 34 month old : She’s able to move with the help of an « orchidée »; she’s in the position to crawl but without succeeding to move forward. At 35 month old we start the Medek method! With this method, we finally have the feeling to make a big step in the Zoé’s rehabilitation! Zoe is smiling all the time; she’s a motivated little girl who loves to talk! Thanks to our integration in EnoRev’ association, we know that 2017 will be full of emotions!! « Always listen to the parents » concluded our new paediatrician at the end of our story. « Remember that » she advised the young intern at her side. Let other doctors follow this advice! 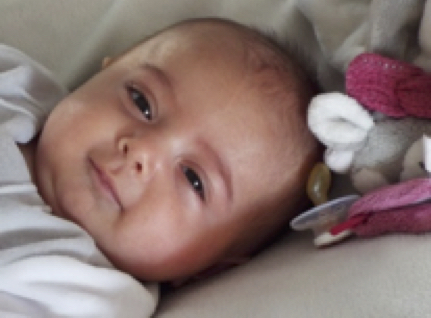 The diagnosis of « spastic diplegia » was confirmed as late as 19 months after Enora A.’s birth, despite the fact that we, the parents, had been telling doctors about suspicious stiffness for ages. A the 9 months check-up, the paediatrician ticked all the boxes without even listening when we tried to explain that, no, she had still not started crawling. 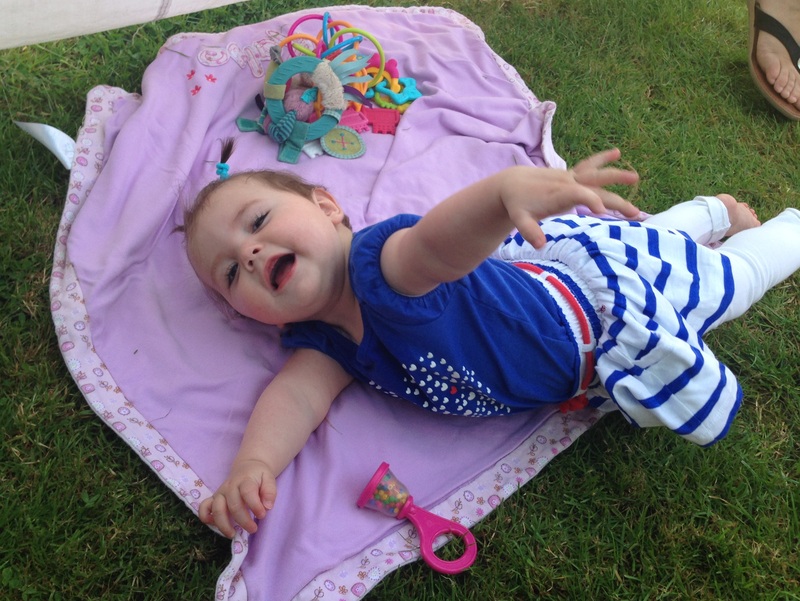 At the age of 12 months, and thanks to the work of a physiotherapist not easily moved by her tears, Enora finally managed to crawl. It was a struggle, but it worked. 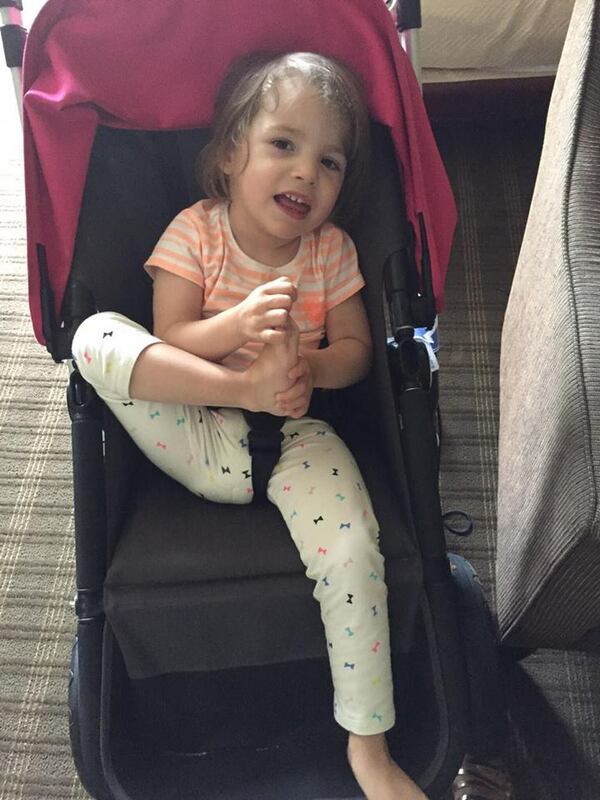 Given that at the age of 14 months, Enora was still unable to walk and showed signs of a pronounced valgus affecting both feet, we decided to consult an orthopaedic surgeon. The surgeon had a solid reputation in the Toulouse region. « Madam, all parents want their child to walk as soon as possible. Leave her alone, she will walk when she’s good and ready. Come back and see me when she’s been walking for 6 months”. It goes without saying that we have not seen this gentleman since, but his arrogance cost us precious months as he made us doubt ourselves. Spastic Diplegia, otherwise known as Little’s Disease. The diagnosis was made without hesitation. We were immediately sent to a rehabilitation centre and were signed up for two physical therapy sessions per week. « Only two?” I asked, surprised. « Madam, I’m not sure if you fully realise that you have years of rehabilitation ahead of you. You mustn’t exhaust yourself right from the start, nor should Enora”. We quickly realised that “do not do too much” was the motto of this centre. A motto that would influence our decision to leave the centre 5 months later, after which time we had come to terms with our new life – a life with disability. Enora celebrated her second birthday. Since that day, we have been running a race against time. The clock was ticking – Enora’s little brain wouldn’t remain malleable forever. We were committed to winning the race! None of this would have been possible without the huge efforts we had invested. And the progress would have been even more significant had we started at a younger age! Unfortunately, growth and spasticity not being best buddies, were already working against her, and because Enora had to start preschool and we were no longer able to spend as much time on her rehabilitation as before. This why we chose to get Enora a surgery which in not known in France: the Selective Dorsal Rhizotomy (SDR) Single Level. Yes, contrary to the sayings of our Neuro-Paediatrician, we can state this: there is a surgery which can permanently eliminate (or greatly reduce) the spasticity of the lower limbs! (for the non-degenerative pathologies of course). What a scoop, isn’t it? We let you discover the SDR surgery here. We were a little bit pioneers as we were only the second French family to have had the surgery done by Dr Park. Fortunately, the good news has since spread, and about ten children chose to have the surgery, less than a year after our testimony. Of course, miracles don’t exist, and this does not mean that the battle is over, but at least the odds are better! Enora T., our little Enora was born prematurely at 29 weeks …, i.e. just 6 months of pregnancy. Her very premature birth left scars, but not heeding the advice of some doctors, we chose to fight to give her the best chance possible! 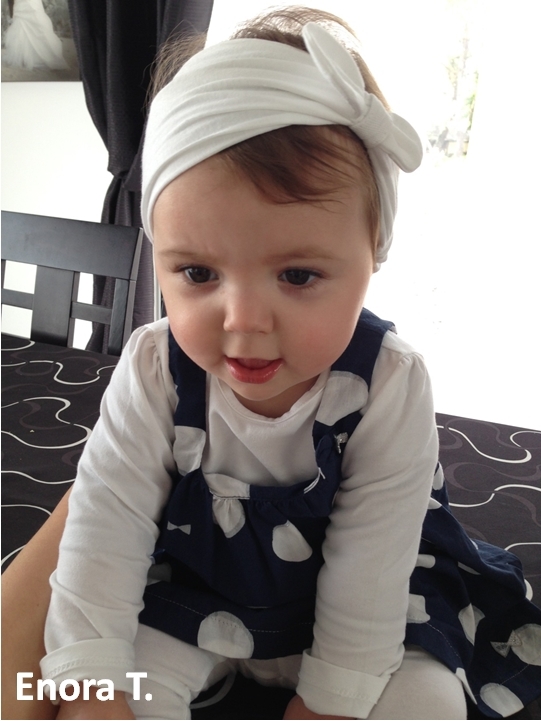 At 11 months, Enora T. was able roll herself over and hold her head up. At a year old, Enora T. was able to hold the toys we gave her. We started using the MEDEK method in September 2014, and soon our little sweetie was progressing by leaps and bounds! 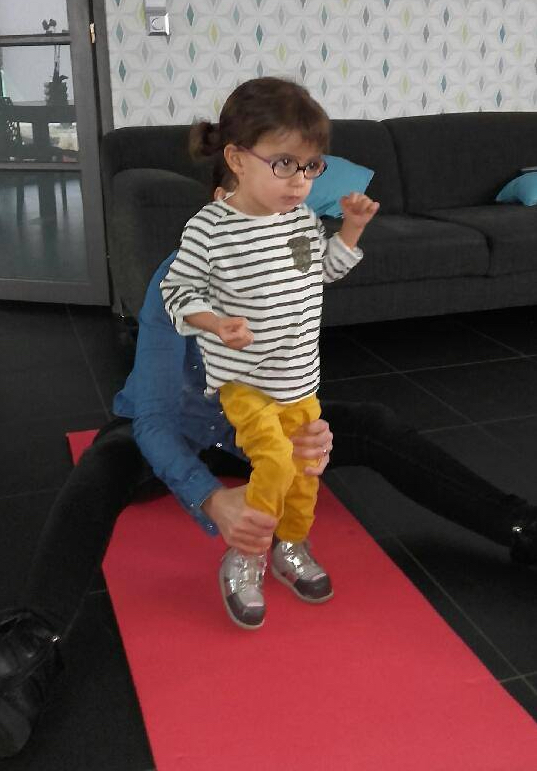 Thanks to the Medek method, which we were able to practice in Toulouse with the physiotherapist Océane Javaux, Enora T., who had never been able to sit up before, was sitting for one whole minute, after just 4 sessions (she was 16 months old)… As you can imagine, once we had witnessed this incredible progress, nothing could stop us! So we continued with 45 minute sessions at home, every day. 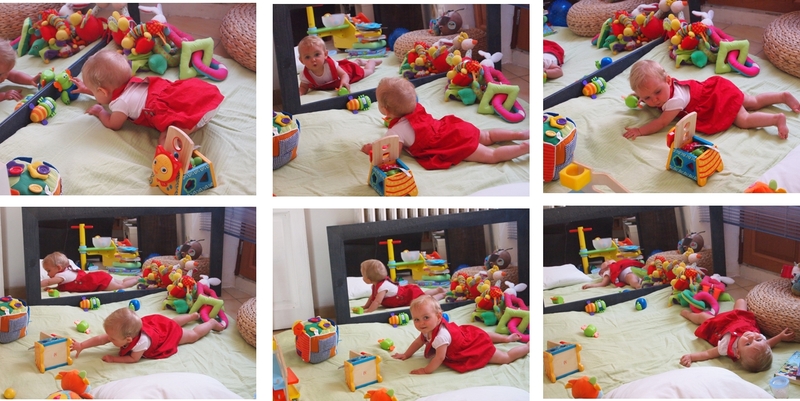 Until one day Enora suddenly started to crawl … It was in November 2014, Enora was 18 months old! In December 2015, she started climbing stairs on all fours (31 months old). 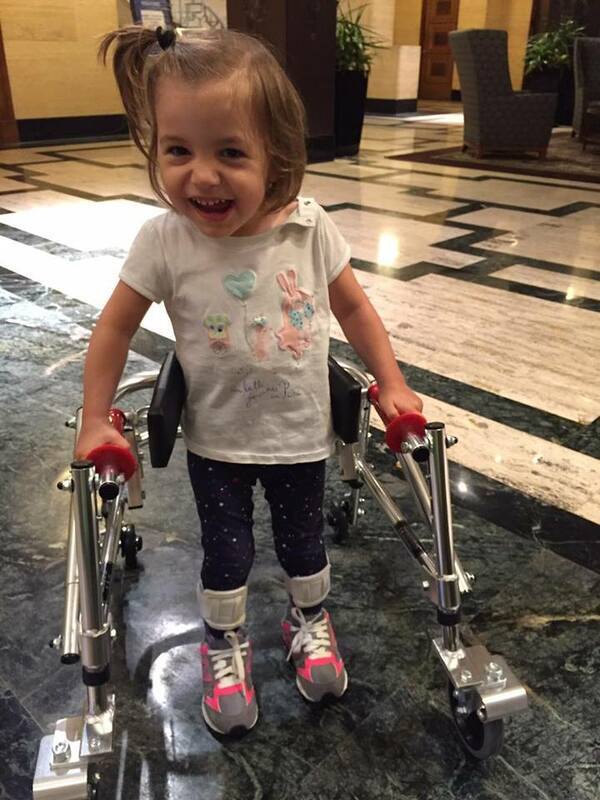 At the end of June 2016, following Enora A.’s footsteps, Enora T. had a Selective Dorsal Rhizotomy at 3 years old. We were full of joy. Straight after the surgery, Enora T. discovered her much looser, new body. She was able to catch her feet by herself, which was impossible before the surgery. After three weeks of physiotherapy post-surgery, she knew how to use the walking frame to take a few steps by herself. It was the beginning of her autonomy! We still have so much therapy ahead of us, but we’re not afraid; we will give whatever it takes to get the best for her. Presently, Enora T. is a little girl full of life, curious and with a sunny disposition. She is a cheeky monkey! She is making progress thanks to her determination.